Hi all and welcome! Our fabulous French team member, Cecile Ribon is our hostess at Freshly Made Sketches and she has a wonderful and unique sketch for us. I saw the shapes inside each other and decided to use layered negative die-cuts to achieve the same look. I die-cut the stitched stars from three blue shades of MFT cardstock and layered the negative shapes one on top of the other. On the top Tropical Teal layer, I ran it through a stitched frame die to match the stars. After adhering the three layers together, I added foam tape to the bottom and attached them to a white top-folding card base. I white-embossed the second part of the sentiment and added a black die-cut word and called it done. Thanks so much for visiting! 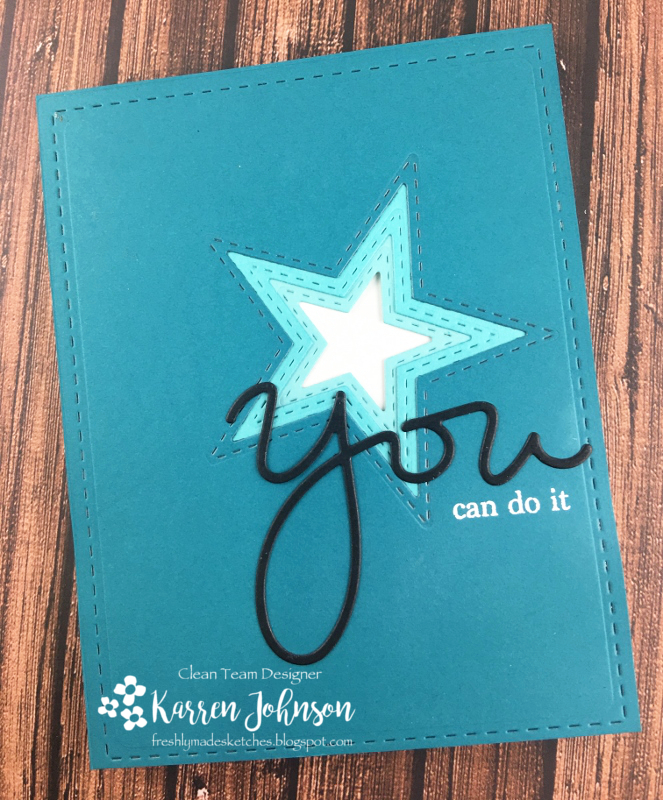 Head on over and check out the fabulous cards made by the rest of the design team. 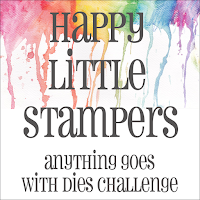 I'm going to link this up to the Anything Goes challenge at Addicted to Stamps and More and the Anything Goes with Dies challenge at Happy Little Stampers. LOVE your star layers with the stitching!! The big "you" and the white "can do it" is such a fun way to include the sentiment! Fabulous take on the sketch, Karren! I love how you layered the stars and the stitching is the perfect touch! Love your over-sized die cut sentiment, too! I love what you did with the die cuts! The layers and stitching are perfect!Very cool take on the sketch! This is such a great card Karren! I love those stars! What a great idea! Such a fun sentiment too! Fabulous negative die cutting Karren. I would never get it in the right place LOL Love the 'you' placement too. A fab design. This is fantastic!! I LOVE the layering of the stars and the stitches. GREAT take on that sketch!! I love how you've used negative die-cuts for this sketch! 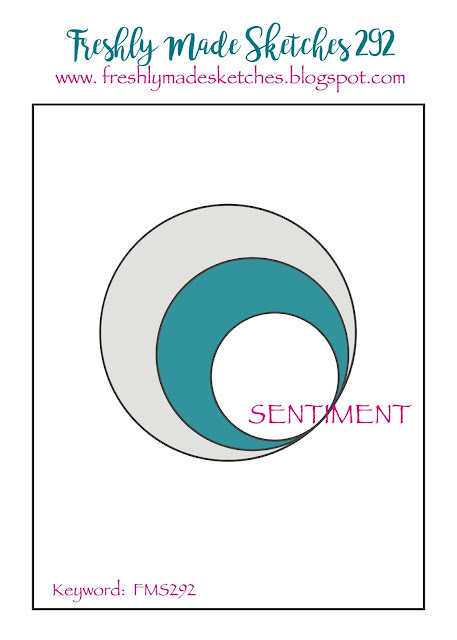 And the sentiment works beautifully with it all. 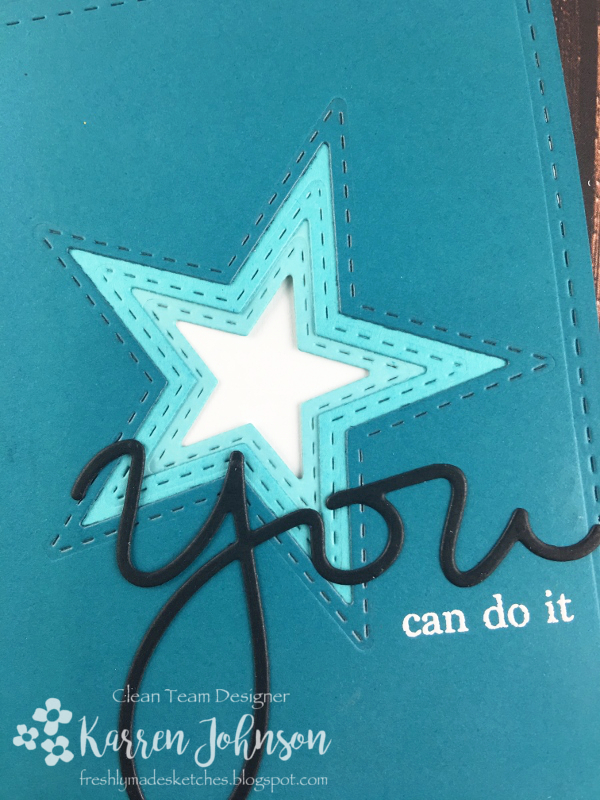 Fabulous card, Karren! Now that's a fun take on the sketch! I think I've got those star dies and never quite know what to do with them. Now I do! These layered stars are such fun for the sketch. Love the big die cut sentiment. Such a clever take on the card! I love how you've used stars instead of circles!